This line is open. Its main line runs from Grange Court, near Gloucester, to Neyland, by Milford Haven. From Grange Court, near Gloucester (on the Gloucester and Dean Forest Railway, Gloucester to Grange Court opened on Sept 19 1851), to Milford Haven via Chepstow, Cardiff, Swansea, Newport and Carmarthen. There were branches to the docks at Swansea North Dock, Bullo Pill and Cardiff Bute Docks; and branches to the Swansea Vale Railway and Forest of Dean, Bullo Pill to Churchway which was converted from a tramway. 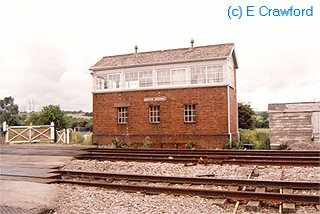 This signalbox is to the east of the Llanwern Steelworks. There is a level crossing here with gates controlled from the box and an underpass - although the clearance for the underpass is quite restricted and only small cars or pedestrians can pass through. This is a west facing junction. The Llanwern Steelworks have been closed to a certain extent, but are still very much in business.